Santo, as this island is affectionately known, is the largest island in the group and its capital Luganville is Vanuatu’s second major urban centre. The island features some of Vanuatu’s best-known attractions including the beautiful Champagne Beach and the Ri Ri Blue holes. It is, however, most famous for its incredible pristine waters for excellent kayaking, snorkelling, scuba diving & fishing. Resorts on Santo tend to be small, often a bit quirky but always in fabulous locations and offering fantastic hospitality. Conveniently close to most resorts is the worlds most accessible shipwreck, AA president Coolidge, a luxury liner converted into a World War II troop ship that sank in 1942 after hitting two allied mines, and is today one of the most popular dive sites in the South Pacific. When you combine these attractions with beautiful scenery and an incredibly welcoming local community, you have a holiday experience like no other. Efate is the most visited island in Vanuatu, and home to Port Vila, Vanuatu’s capital city and commercial hub. This endearingly quaint town hosts a fantastic array of restaurants located around a magnificent natural harbour. Treat yourself to a selection of vastly different cuisines that are fast making Port Vila famous for its gourmet delights. The potpourri of expatriate cultures is reflected in food styles served in over forty restaurants and cafes. You can buy an Aussie meat pie or American chilli dog, sip a cappuccino in one of the many outdoor cafés or purchase paté or salads from a French patisserie in a supermarket to fill your picnic hamper. Port Vila features the majority of Vanuatu’s resorts and hotels and a growing number of exciting day tours and activities. The surrounding landscape offers tropical mountains, rugged coastline and secluded beaches. Efate provides you with the ideal combination of a tropical beach/harbour holiday with convenient access to Port Vila township and the islands many activities. 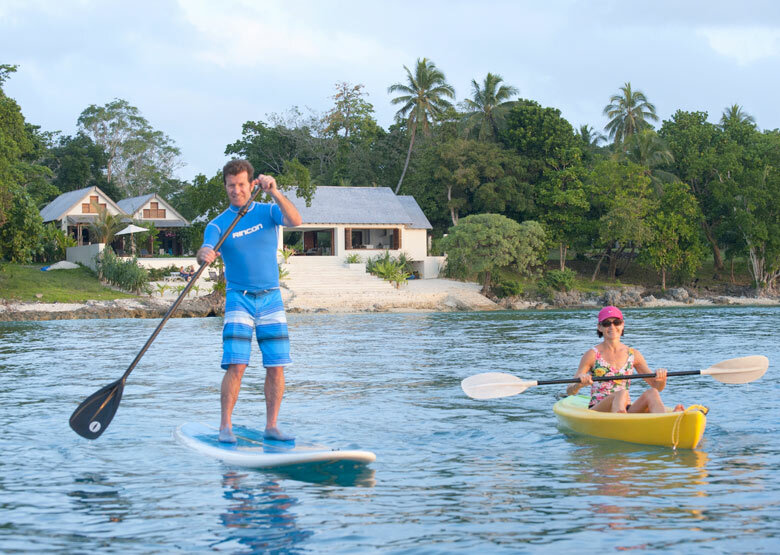 CLICK HERE to discover what the Escape Artist loves most about Port Vila. Tips and travel secrets about this amazing destination. Visiting the island of Tanna (approx 50-minute flight from Port Vila) is akin to visiting another world, as it is so vastly removed from our “every day”. It is most famous for Mt Yasur Volcano, widely considered to be one of the most accessible live volcanoes in the world. Best viewed at dusk, you can walk to within 100 metres of the edge of the crater and witness first hand, Mother Nature’s impressive display. The volcano and natural beauty of this island are breathtaking. However, there is so much more to Tanna ready for you to explore. There are numerous traditional villages known as “Kastom”, which still live today as their ancestors did, participating in age-old ceremonies. For the adventure lovers, there is no shortage of wanderlust. Snorkel with a turtle colony. Swim in crystal blue holes. Explore the stunning Lemnap underwater cave. Watch whales during their migration or relax on a beautiful sand beach made of black lava particles. If time permits, allow a minimum of 3-5 days in Tanna as there is so much to see and do. At a minimum stay overnight to experience the volcano at dusk. CLICK HERE to discover what the Escape Artist loves most about Tanna. Tips and travel secrets about this amazing destination.